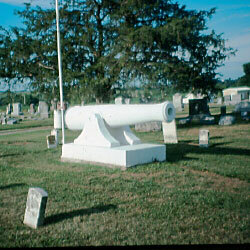 Description: A 42-pdr Seacoast Gun, M1845, is mounted on concrete base, surrounded by graves of Union veterans. Description: A bronze smoothbore Napoleon cannon on a polished granite base. 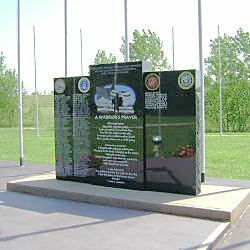 The front of the base is inscribed: "To Invoke Thoughts Of ~ Those Who Sacrifice For ~ Your Freedom ~ Dedicated ~ May 1915 ~ Rededicated ~ May 2000". 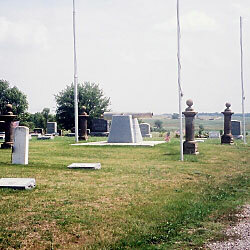 Description: A polished black granite memorial marker is placed on a plaza, surrounded by flagpoles. The main marker reads: "Dedicated to the brave Kickapoo men and women ~ who have given their time and their lives ~ in defense of this land." Below this is inscribed: "A Warrior's Prayer ~ Oh Great Spirit ~ Hear this warrior's plea, ~ I am a warrior, I was born free. ~ Free like the clouds in the sky, ~ I moved across Grandmother Earth ~ like a gentle breeze, on a swift pony. ~ I became a warrior, ~ I fought with courage and honor. ~ I fought on the land, I fought on the water, ~ I fought in the sky. ~ While I fought, I was shot at, wounded, ~ and even gave my life, ~ still I fought on bravely. ~ I am free now, ~ my spirit soars like the eagle in the sky. ~ I am free now, in the hands of our ~ Creator. ~ I was a warrior."